Scouting for new Wine Exchange venues that we haven’t already been to can prove to be a little bit of a challenge. 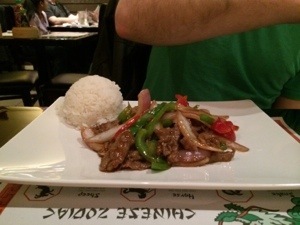 TasteBudA is currently on the hunt for a great place to invite our dinner group to in April and on Friday we went to Lin’s Asian Fusion on the South Side to see if it was up to the TasteBuds standards to host us. Since the South Side isn’t exactly a hot bed of BYOB restaurants, Lin’s Asian Fusion has been overlooked by us for quite some time. After TasteBudA was impressed by their soup offering during the South Side Soup Contest, he felt it was worth a dinner excursion to get a full sense of the restaurant. Inconsistent reviews of the restaurant on Yelp and Urbanspoon left us wondering what side of the restaurant we’d experience. Upon arrival, we were greeted nicely and promptly sat. Our waitress was pleasant and quickly got us our beverages. Since this was on the eve of St. Patrick’s Day, so we omitted bringing wine knowing we had a big day ahead of us, but felt we could gauge the venue for our event anyway. 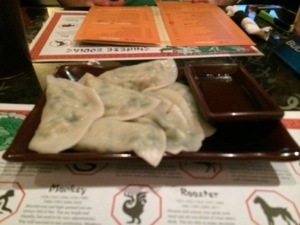 We started with Vegetable Gyoza, which was a cross between a mixed vegetable pierogi and a pot sticker. It was nice and light and probably the closest you could get to a fresh spring roll, which is what I was ultimately craving. Hungry for a mixture of meats, I waivered between the Ma La Trio and the Mixed Basil. The waitress had never had the Ma La Sauce, so she recommended the Basil as a lighter sauce. Yes, the basil sauce was light and not up to the default spiciness that I’m accustomed to from Nicky’s Thai Kitchen or the Silk Elephant. TasteBudA got the Pepper Steak with Onion which comes in a brown sauce. The dish wasn’t overly saucy, but the vegetables looked delicious as the popped off the plate. Tastewise, the dish was just okay to TasteBudA’s standards. Living on the northside, this beats China Taste by a long shot, but wouldn’t be special enough to invite our wine dinner crowd. In the end, I don’t think we’ll be having a wine exchange at Lin’s Asian Fusion. 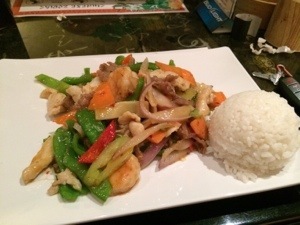 The food was just okay and while the service was great, I felt somewhat rushed out the door. When you get that rushed feeling, it makes you wonder how a restaurant would handle a casual wine dinner crowd who are never in a rush.